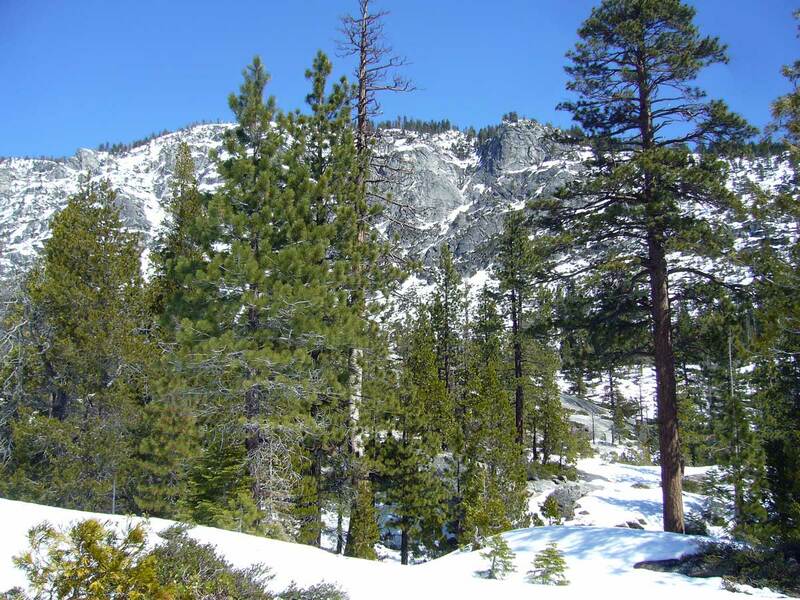 On the western slopes of the Sierra Nevada, Hwy 50 follows the American River Valley on its way up to Echo Summit before dropping precipitously into Lake Tahoe Basin. 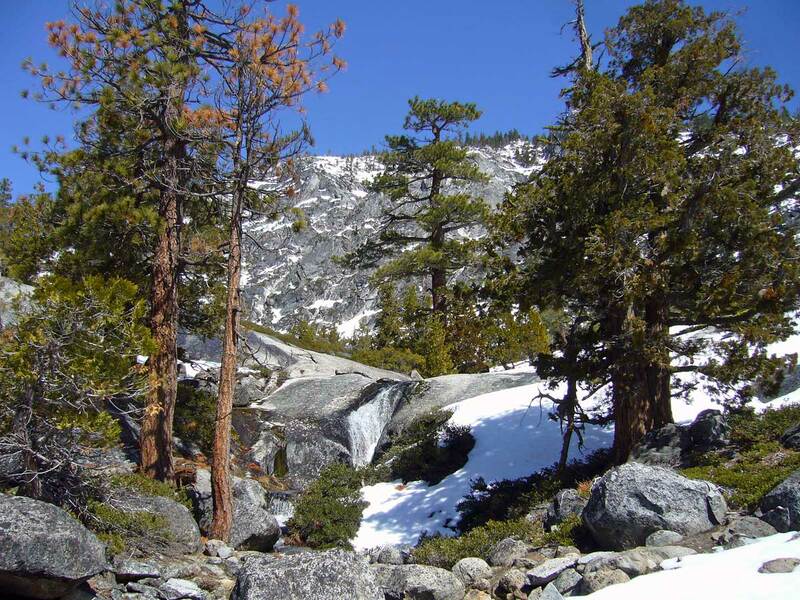 A few miles from the summit and 13 miles east of the quaint mountain town of Strawberry lies a spectacular gorge – born of glaciers and boasting one of California’s top ten waterfalls. During the warmer months, the small Forest Service parking lot that provides access to the gorge is constantly choked with cars, and throngs of people can be seen milling about. I have passed this place many times during the five years I lived in Sacramento, and though the crowds suggest that the area truly is spectacular, the idea of sharing a visit with so many strangers and their dogs was always out of the question. 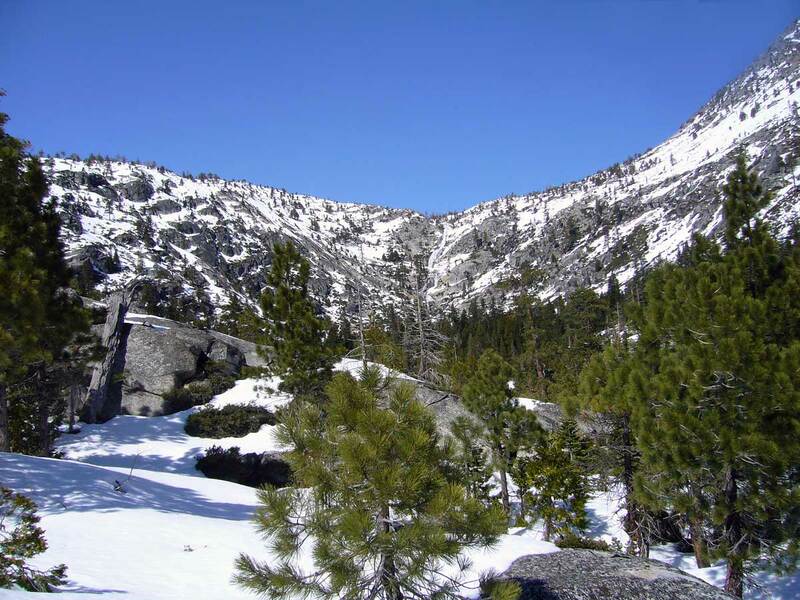 Yesterday, as daughter Madison and I drove down Hwy 50 to that very spot, I wondered what crowds we might encounter, hopeful that during this winter “off-season” we might luck out and enjoy at least some fragments of the kind of solitude that befits such a magnificent example of California wilderness. 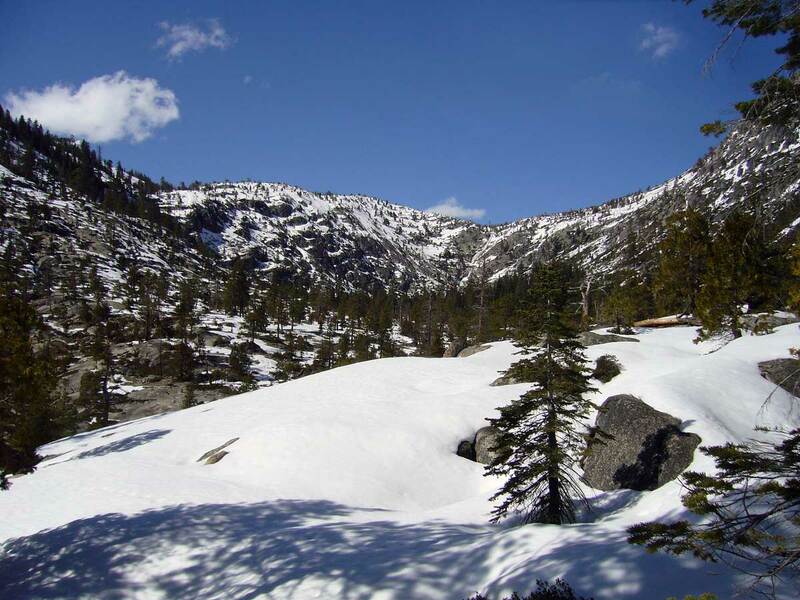 At 6,200 feet elevation, there was still plenty of snow on the ground, and unbeknown to me this USDA Recreation Site is officially closed during the winter months. The parking lot gates were locked, and there was not a car nor a person to be seen anywhere in the vicinity. That did not deter us – despite the many “No Parking” signs along each side of the highway – necessary during the summer months to prevent the throngs from creating chaos – we found a small turnoff in which we were able to tuck away the car and begin our little adventure to see Pyramid Creek Geological Area and its main attractions – Horsetail Falls and Cascade Vista. 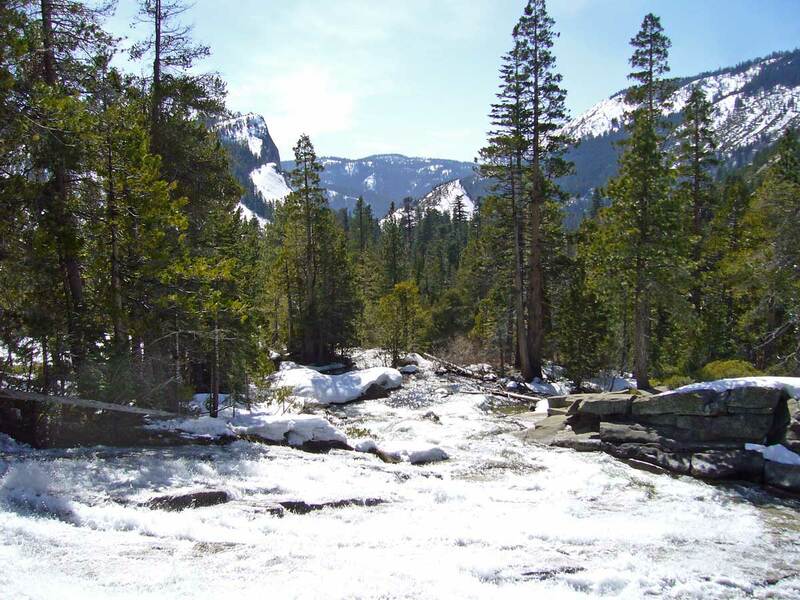 The gorge – named for the creek that originates at the base of the falls – was formed during the same late Pleistocene glaciations that formed Emerald Bay in Lake Tahoe. Vertical cliffs of granite tower above the U-shaped gorge, whose smooth granite domes remain littered with glacial scree (boulders and smaller rocks of assorted sizes). We lost the trail almost immediately due to snow, but since we knew we could not get lost (with a mountain on each side of us) we decided to bushwhack as far as we could. It was rough going, and with a hiking partner only 4′ in height the deep snow was a formidable obstacle. Still, we soldiered on, zigzagging from this granite exposure to that, testing (and often sinking) into the snow-covered plains between them, and splashing along the many meltwater streams that were gushing on this warm, early-spring day, until finally we could go no further. We were still a quarter mile from the falls (only a 1.25-miles hike from the trailhead if one uses the established trail), yet still the view was mesmerizing! As a father, I should probably be glad we did not make it all the way to the falls, as a number of people have been killed over the years when they got too close to the edge of the constantly wet rocks. On the way back, we spotted some granite exposures that we hadn’t seen earlier that suggested we might be able to get all the way up next to the Cascade Vista, and in this we were successful. We scrambled over the rocks and snow, ever careful but proud for giving the effort, before retracing our tracks back to a clear shot out of the gorge. Words cannot express the overwhelming beauty of the landscape we explored, the joy in doing so without ever encountering another human being and the expansive feeling of solitude that that allows, and the exhausted satisfaction that results from hiking over rough, snowy terrain for more than 5 hours. Daughter Madison did great, and I almost had to rip her from the area she was having so much fun. She asked question after question as I showed her cracks in the rocks and explained the carving actions of water over the millennia, how water can create such a landscape. “Water always wins,” I told her. My botanizing trip to Emerald Bay two days before had also prepared me well for this trip, as I was able to recognize every single woody plant I encountered in the gorge (the mosses and ferns will have to wait for another day). Evidence of glacial carvings can be seen in the American River valley below. 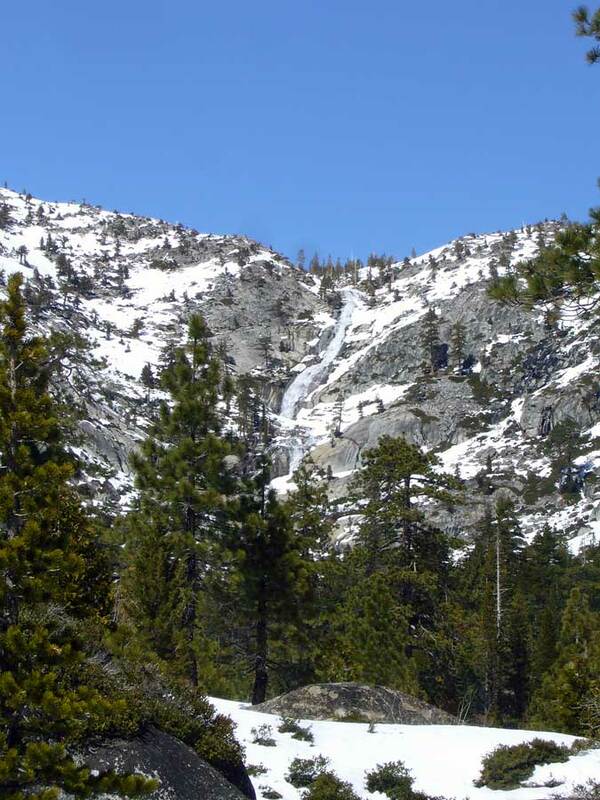 A small waterfall flanked by Jeffrey pine and Sierra juniper previews what is still to come. Another view south into the American River valley from a little higher up. 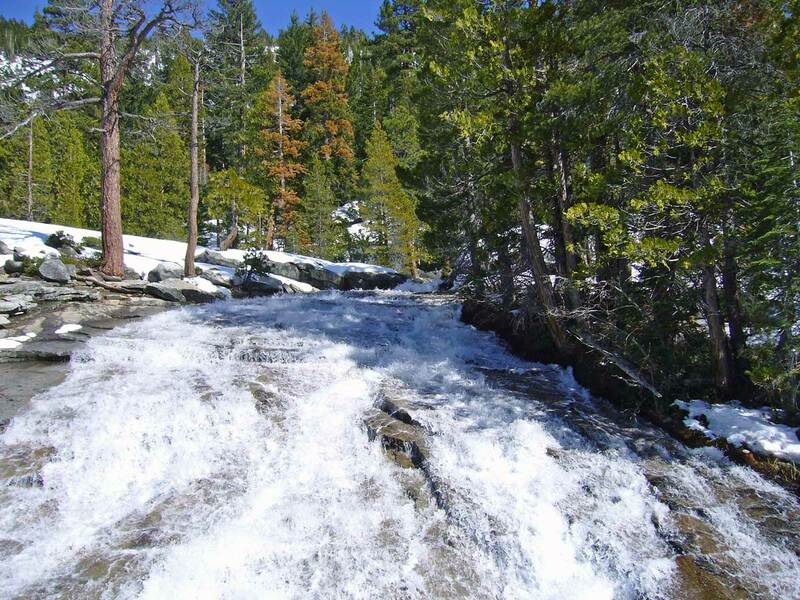 Horsetail Falls is gushing from the snowmelt. A distant view of Horsetail Falls. Looking down on the Cascade Vista and the American River valley. A distant view of Horsetail Falls from the Cascade Vista. Pyramid Creek sheets in a continuous cascade over the granite bedrock. 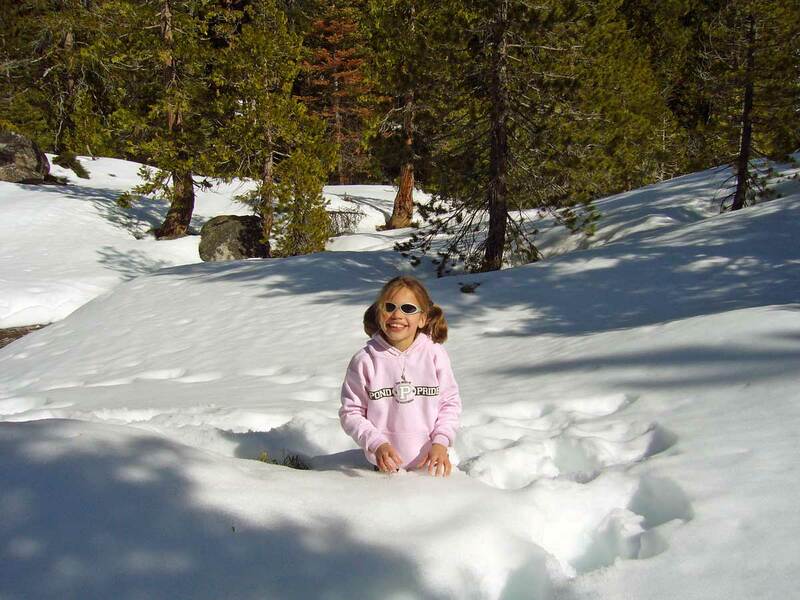 Deep snow was a continuous obstacle for myself, and for 4'-tall Madison. 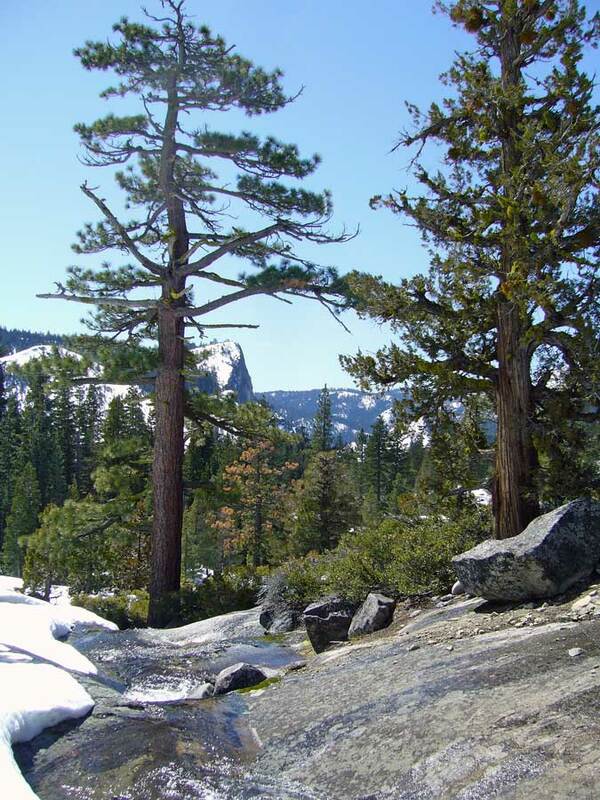 This entry was posted in Cupressaceae, Pinaceae and tagged Botany, California, family, geology, Hiking, Lake Tahoe, landscapes, nature, science, snow, trees. Bookmark the permalink. Like you, I can’t abide a crowded outdoor experience. Great that your daughter can experience this despite the obstacles. The landscape up there is beautiful, thanks for the pictures! I find it fun to read about your excursions with Google Earth open in a second window. Your explanations of the land forms are great. I’ve been to the sand hills of Nebraska and now this part of the Sierras (and many more). Thanks! What a great time you and your daughter got to have together. I’m sure she will remember it for years to come. 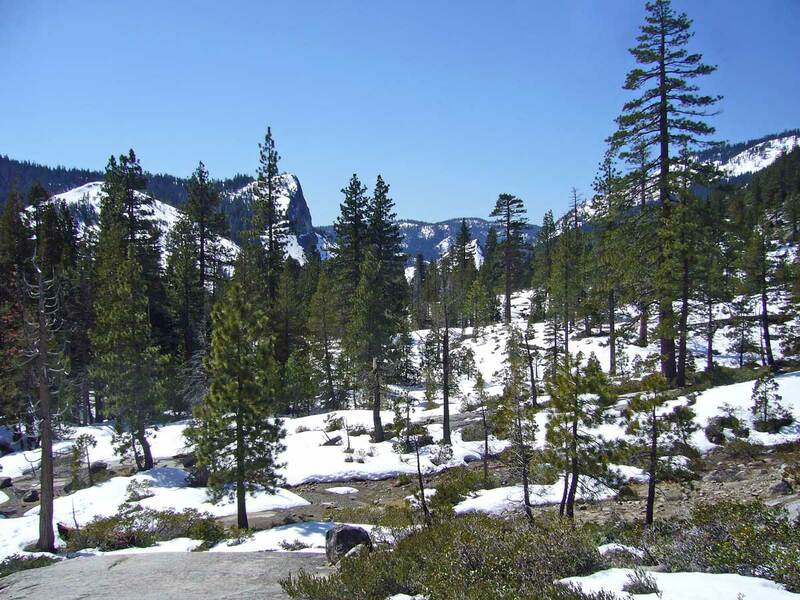 Your pictures remind me of areas in Tuolomne Meadows at Yosemite, as they should. Thanks, all. Everything came together that day – complete solitude and extraordinary warmth that made for pleasant conditions despite the snow and allowed us to witness gushing meltwaters in a premier scenic spot all by ourselves. I don’t know what I enjoyed more – getting to see this spot on this day, or watching Madison having the time of her life doing something I love.